If the device is Mobile Broadband capable and is located outside of the Mobile Broadband Coverage Area, then the device reverts to a NationalAccess connection, if available. When connected to NationalAccess the device won't experience the same speed or throughput as when connected to Mobile Broadband. From the status bar (located in the lower-left corner) verify the available networks listed e.g., Mobile Broadband (EV-RevA). 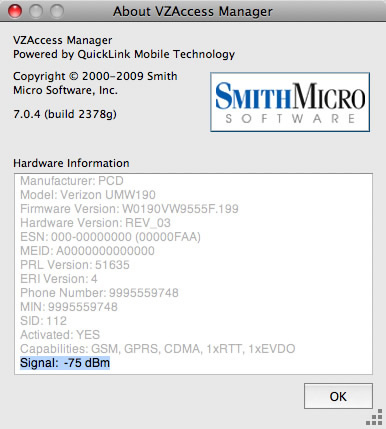 From the main screen of VZAccess® Manager, locate the signal strength indicator located to the right of the available network(s). From Menu Bar, click VZAccess Manager > About VZAccess Manager. Verify the RSSI (indicated as signal). For a reliable connection, the RSSI should be greater than -95 dBm (e.g., -73 dBm). A value of -125 dBm indicates no signal. If the signal is between -95 dBm and -125 dBm, move the device to an alternate location (an outdoor location is preferable).